If being damned meant I could eat devil’s food cake every day then send me straight to hell. What makes a “classic” devil’s food cake recipe is debatable, but one thing is not open for discussion, and that is the simple fact that devil’s food cake is delicious. Alternately known as the the best cake ever, devil’s food is a rich, moist, airy cake. I was compelled to make these after several late-night Diablo 2 sessions with Boyfriend. After a few dungeon crawls which culminated in fighting various demons and devils, I woke up the other day with three words on my mind: devil’s food cake. It’s divine inspiration. These were made from the “classic devil’s food cake” recipe in my beloved Chocolate! book by Good Housekeeping, which is available on Amazon.com and Amazon.ca. I planned to make chocolate buttercream but when it was time to make the frosting I forgot, so these beauties are frosted with luscious vanilla buttercream. Good to know before you start: although you can substitute buttermilk by adding white vinegar to regular milk, it is worth using real buttermilk for this. I’ve done the substitution a few times, but I find the flavour and texture of cake batter made with real buttermilk is much, much better. I spent $2.69 on a 1L carton. I used to avoid buying it because I had no idea what to do with the leftover milk, but I will just MAKE MORE CUPCAKES NOM NOM NOM. Before you open the buttermilk shake it well. I was experimenting with camera settings for these shots. My apologies if the lightning is off. 2. 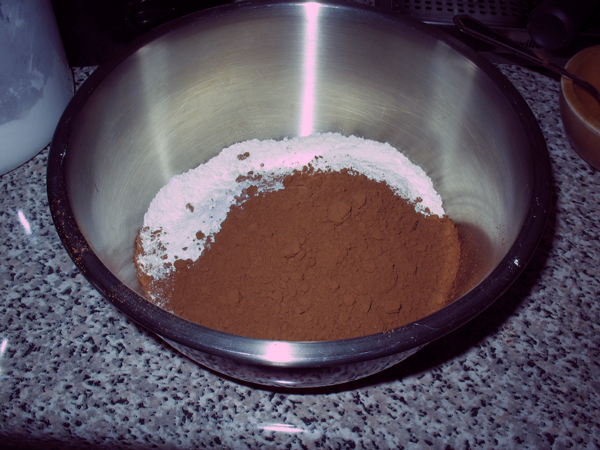 In a medium bowl combine: flour, cocoa, baking soda, and salt. Set aside. 3. 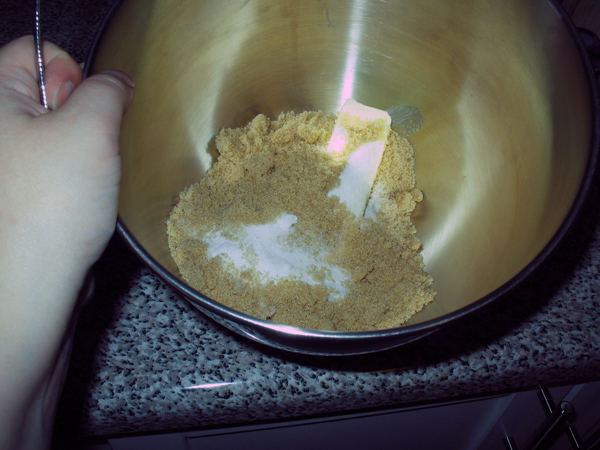 In a mixing bowl at low speed, beat: butter, brown sugar, and white sugar, until blended. Increase speed to high: beat 5 min until it’s light and fluffy. 4. Reduce speed to medium and add the eggs one at a time. Sometimes when Boyfriend walks into the kitchen, he will find me already in there, staring at my blue mixer. 6. 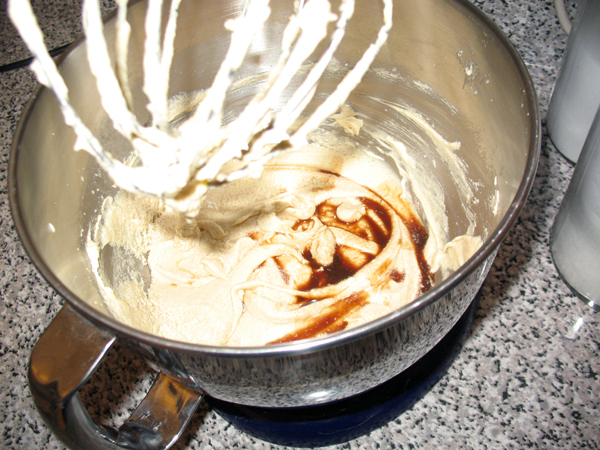 Add the dry mixture and buttermilk alternating like so: half of the flour, all the buttermilk, and the rest of the flour. After each addition beat until just combined. 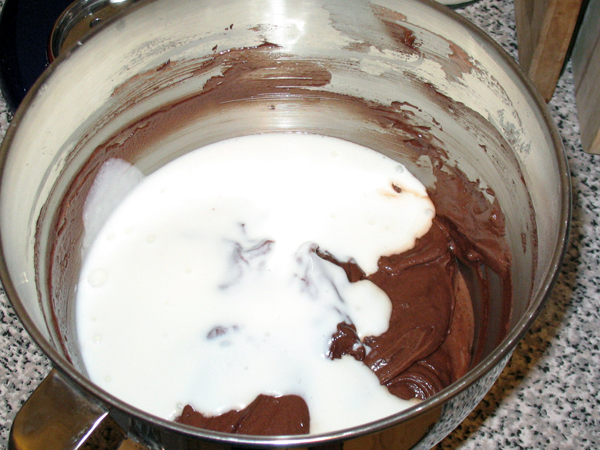 Scrape the sides a few times and make sure the batter is smooth. 7. 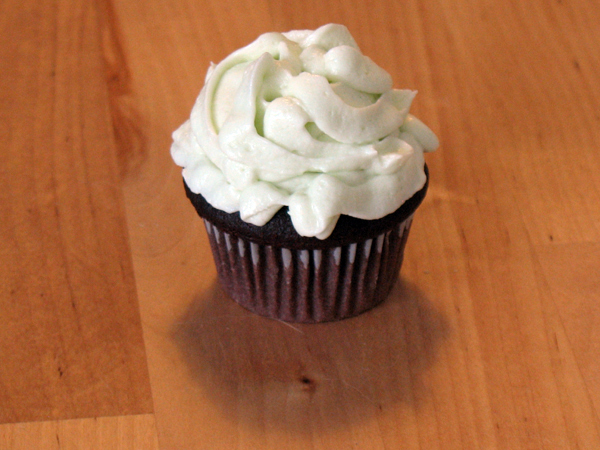 Bake times: 14-15 min for mini cupcakes, at least 20 min for full size cupcakes, 30-35 min for 8″ rounds. If making the round cakes, place two pans on top rack and one on bottom rack, no pan should be completely on top of another to allow air circulation. A toothpick inserted should come out nearly clean. 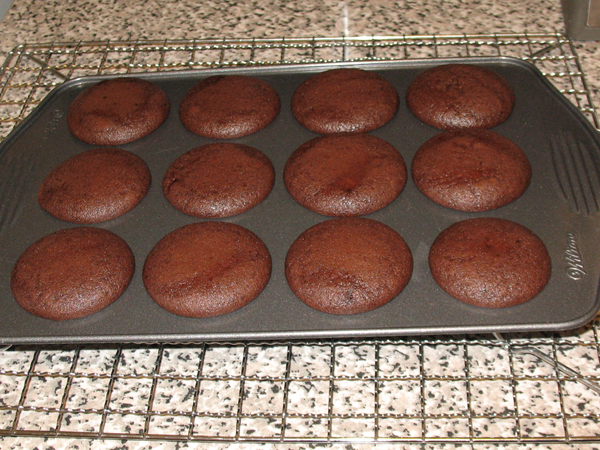 Let cupcakes cool in pan one minute before removing from pan and placing on rack. Let cakes cool 10 minutes before using thin knife to loosen edges and inverting onto rack. Cool for at least one hour before frosting. 8. Frost! Oops. Forgot about making chocolate buttercream and made my regular vanilla buttercream for this: cream together 5 TBSP of unsalted butter at room temperature with 3 C of icing sugar. One at a time, mix in 1 TBSP milk, 1 TSP pure vanilla, and 1 TBSP lemon juice. If desired add a few drops of food colouring. Verdict: Delicious. OMG. Delicious. Love love love. Real buttermilk batter is where it’s at. Although I like mini cupcakes (because I can argue that eating two is only the equivalent of one), making them is aggravating. 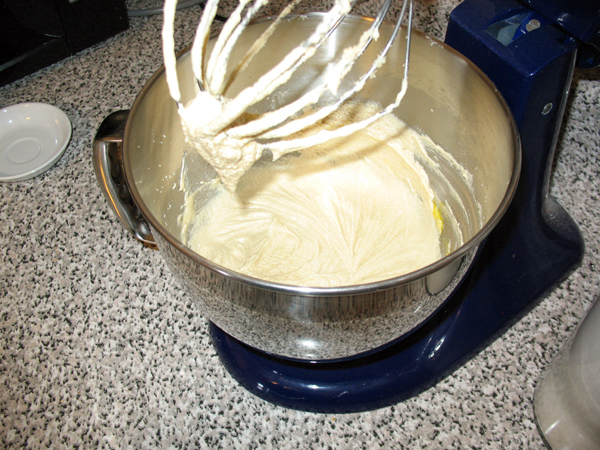 Manipulating batter into such a small space is so annoying. I have half a carton of buttermilk left though. Ah hah! I’ll just make full size cupcakes!! I’ve been looking for an excuse to practice making buttercream roses. Perhaps I failed at making a perfect rose (more of an artists’ interpretation of a white carnation) but whatever! I still make heavenly cupcakes. The humidity is part of the problem, normally my frosting is firmer, but it’s been so humid and it came out slightly runny, which made is easy to pipe but it couldn’t hold a shape well. 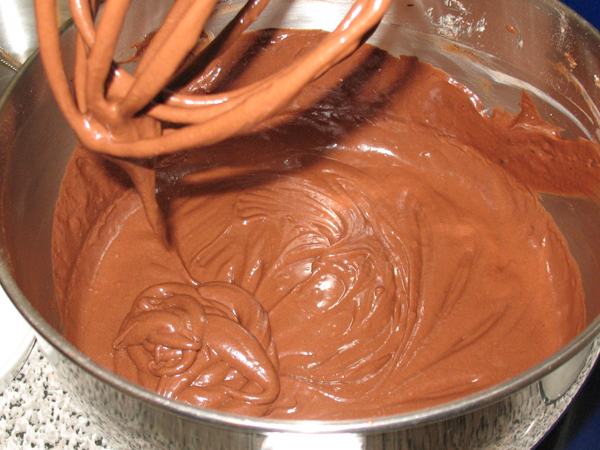 I’ll make up another batch in a few days and will definitely go for chocolate buttercream. 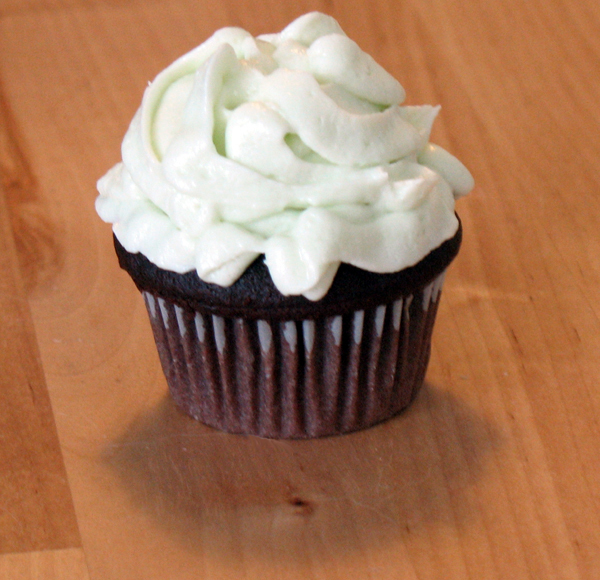 What is your favourite cupcake and frosting flavour combination? This entry was posted in cakes & cupcakes and tagged books, boyfriend, buttercream, chocolate, cupcakes, devil's food cake, food, KitchenAid, recipe, video games. You actually made my favorite combination. Chocolate cake with white icing: yum, yum, yum. I despise the reverse: white cake with chocolate icing. Ew. What did you use to get the icing in that shape? I like the way the icing looks. I used Wilton tip # 102, am toying with the idea of posting a YouTube video showing how. My favourite is chocolate on chocolate, closely followed by vanilla on chocolate. What do you have against chocolate on vanilla? What about chocolate on golden cake? No. Devil’s food cake and red velvet cake have similar characteristics, but they are not the same cake. If you follow this recipe you will not get red velvet (but if you check my archives I have posted a red velvet recipe from February). 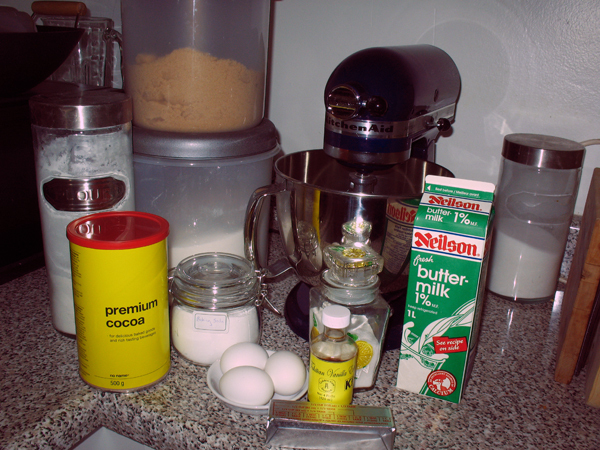 When you make red velvet batter, you don’t actually need to use red dye, because cocoa contains red anthocyanin; and when the vinegar and buttermilk combine, this will bring out the natural red in the cocoa. Adding red dye will just darken the shade of red. To get a “true red”, you either have to use a LOT of dye (which will taste bad), or use a “no taste red” which most grocery stores do not carry. Anyway when you use food colouring, the colour darkens after it sets. While the batter may look magenta, it sits and bakes and will darken to a redder colour (see my Feb post to see this in action). Those cupcakes look great 🙂 I miss you and mad cows face hasnt improved and I am sprinkling some fairy dust your way.. I hope we can hook up for lunch soon…. ***Red velvet with cream cheese frosting***MMMMMMM!!!! !